With the BJP set to form the government in Gujarat and Himachal Pradesh, ThePrint takes a look at the underdogs who became ‘giant killers’. The counting of votes is underway in the key state of Gujarat with the BJP in the lead. The party which has been ruling Gujarat for the last two decades is on its way to crossing the majority mark of 92 in the state assembly. It is currently ahead in 99 seats (68 won), about 20 seats down from its 2012 number. Jadeja defeated one of the most prominent faces of the Congress, Shaktisinh Gohil, in the Mandvi constituency in Kutch district. He won by a big margin of 10,120 votes. Gohil, who is the national spokesperson for the Congress, was the Leader of the Opposition in the Gujarat Assembly from 2007 to 2012. Asha Patel is leading in the Unjha constituency, where counting is still in progress, with a significant margin of 19,529 votes. Unjha constituency also includes Prime Minister Narendra Modi’s hometown of Vadnagar. Patel was taking on incumbent five-time MLA Narayanbhai Lalludas Patel of the BJP. Asha Patel had lost to Narayanbhai in the 2012 assembly elections. 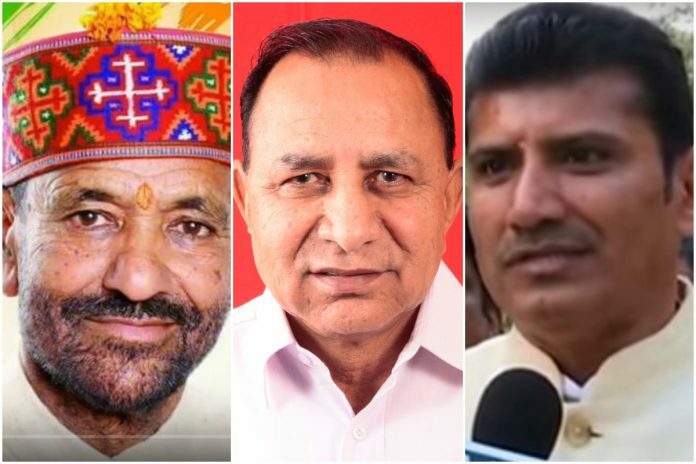 Turning the tables on incumbent MLA Shankarbhai Lagdhirbhai Chaudhary of the BJP, Geniben Nagaji Thakor of the Congress is leading in the Vav constituency with a margin of 6,848 votes. Chaudhary had gone up against Thakor in the 2012 Assembly elections as well, where he won by a margin of 11,911 votes. Bokhiria defeated Arjunbhai Devabhai Modhwadiya of the Congress by a margin of 1,855 votes in the Porbandar constituency. ModhWadiya was the president of the Gujarat Pradesh Congress Committee (GPCC), and the Leader of the Opposition in the Gujarat Legislative Assembly from 2004 to 2007. Mehta, a BJP minister is leading, in the Dabhoi constituency against Congress MLA Siddharth Chimanbhai Patel by a margin of 2,839 votes. Significantly, Siddharth’s father, Chimanbhai Patel was the Chief Minister of Gujarat twice from 1973-1974, and again 1990-1994, until his death. Siddharth has been the president of the GPCC. The BJP is set to win the Himachal Pradesh assembly elections. It already has eight seats in the bag and is leading in 37 constituencies.The Congress has won four seats and is leading in just 15. Prem Kumar Dhumal, BJP’s chief ministerial candidate for the polls, is trailing in the Sujanpur constituency by nearly 3,000 votes. Dhumal who served as the 12th Chief Minister of Himachal Pradesh is up against his former protege Rajinder Rana of the Congress. Satpal Singh Raizada of the Congress is in the lead in the Una constituency, with state BJP chief Satpal Singh Satti trailing by around 1,700 votes. Satti won the last election with a margin of 4,746 votes, defeating Raizada in the 2012 elections. Rakesh Singha of the Communist Party of India (Marxist) has won the Theog constituency, which was the home seat of senior Congress leader Vidya Stokes for decades. Stokes did not contest these elections. Singha had earlier won the Shimla seat in the 1993 elections. Prakash Rana, an independent candidate, is leading in the Jogindernagar constituency with BJP at number two, and the Congress at number three. Rana is an Indian-born diamond merchant based in Saudi Arabia. He also has businesses in transport, construction and engineering equipment. Jia Lal of the BJP is leading in the Bharmour constituency with MLA Thakur Singh Bharmouri of the Congress trailing by more than 7,000 votes. Singh is the forests minister in the current state government. He is a five-time legislator from Bharmour and is seeking a sixth term. Kaul Singh Thakur, the Health and Family Welfare minister in the Himachal Pradesh cabinet, is trailing in the Darang constituency by over 2,000 votes, with Jawahar Thakur of the BJP in the lead. Kaul Singh Thakur has also served twice as the Himachal Pradesh Congress Committee president.